KALKI Fashion’s incredible show made quite a mark with the audience at the Bombay Times Fashion Week 2018. The master couturier showcased his latest wedding collection, ‘ATHENA’ which is a passionate affair between the strong color and crafts of India and an urban outlook that is synonymous with the indigenous tribes of Greek-Morocco. 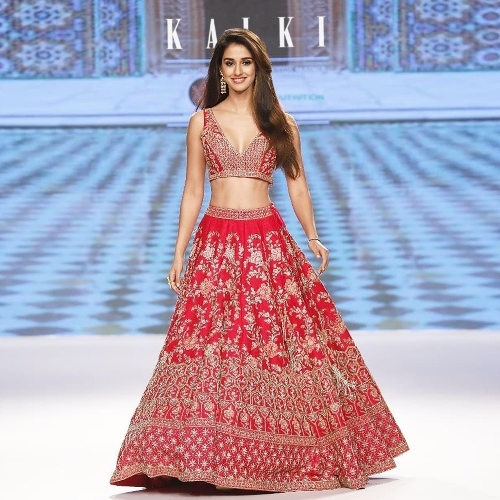 The show saw, Bollywood big league and the super gorgeous, Disha Patani walking the ramp as the showstopper for their new collection. Inspired by the rich heritage of India along with modern edgy elements of Greek-Morocco the designer collection ‘ATHENA’ was set against the gorgeous backdrop of Morocco’s beautiful palace in the world and the designer brand presented the wedding collection in a more ambient and picturesque starlit ramp of the St. Regis, Mumbai. The intricately embroidered styles were a treat for the lovers of all things pastels, bold and mysterious! 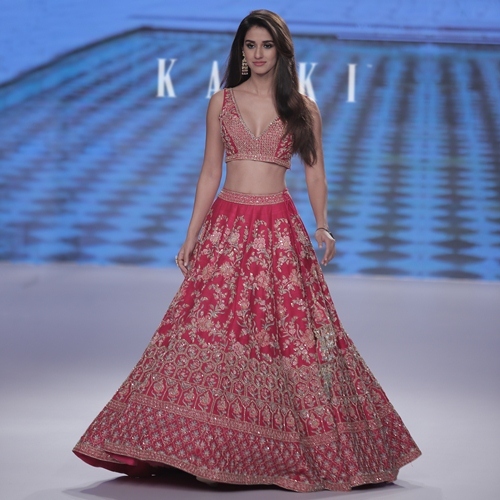 The Bollywood star, Disha Patani was dreamed in a signature piece, in melon pink lehenga with layered embroideries in vintage English colors embellished with gold metal threads, and resham. The innovative design presented on the ramp was a artful conception of floral beautification and symmetric hexagonal construction that blended the ancient art with an eclectic vision to present the finest works inspired from Moroccan roots. It was certainly a trip to Morocco with KALKI Fashion. The collection had a hint of intriguing shades from rustic blues, luscious lavenders to the infusion of dusty mints that are powerful yet amorphous in almost everything from asymmetrical dresses to the plunging ‘V’ necklines worn by the female models. It was definitely a show with a unique concept! The use of the sorbet hues and the feminine silhouettes is what made the collection very preppy indeed! The Floral detailing, the flared gowns and of course the innovative styling, it was quite a surprise package. With a proud display of cultural crafts with contemporary themes, the collection brought to the frontlines an array of designs that spoke volumes about Greek-Morocco’s rich heritage. The signature stark silhouettes were primarily designed with magnificent cuts that looked pretty clean and restrained. The designer’s keen observation of the Morocco interiors and the magical palaces ensured a strong play of ‘shimmery shishas’, beaten silver and gold threads, floral tinted rose gold embellishments beautified onto the exquisite bridal lehengas with stunning shades of pink through the entire collection forming fascinating patterns in unexpected instances.